With summer here and flip-flops in demand. It can sometimes be hard to find a pair that not just fits your feet but also don’t ‘flip flop’ all over the place. These particular Sandals are amazing because you can actually run in them and not have them slip off. They STAY on your FEET! Sandals are so easy and breezy in the heat of summer. You can wear these with just about anything from a dress to shorts even with just a swimsuit. I love these sandals! 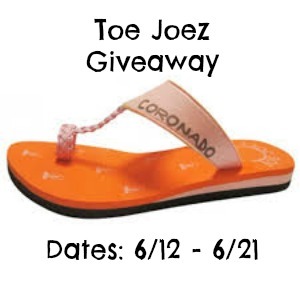 So, in the excitement of summer and being able to wear sandals again Toe Joez is sponsoring a giveaway and is giving away a pair of their sandals to ONE lucky winner. This giveaway is open to all US residents that are 18+. You can enter this giveaway EVERY day from June 12th until June 21st. Have Fun everyone and let the flip-flops stay on. You can enter the giveaway below.